So, we’ve recently made it our goal to get through all the movies on The National Film Registry. This is a nearly impossible goal considering there’s 600 movies on the list, but it’ll be fun to try. Looking at the list led us to The 7th Voyage of Sinbad. 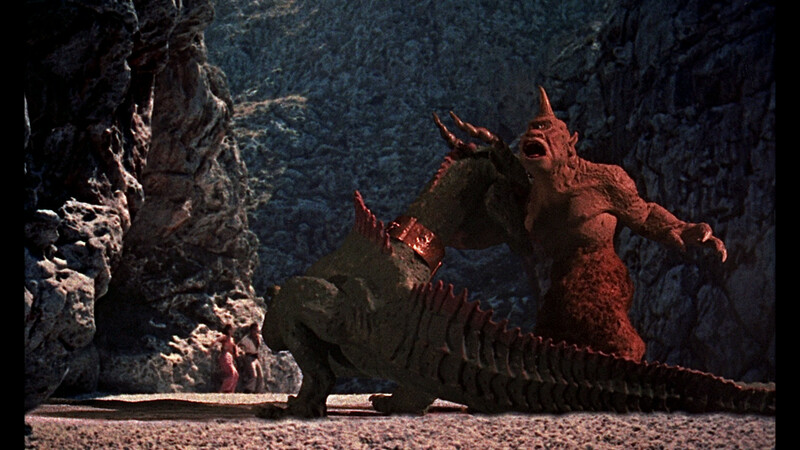 Though we can’t find any official explanations as to why certain movies get picked for the registry, The 7th Voyage of Sinbad must have been chosen because of the stop-motion animation. Though it’s mostly a live-action movie, all of the creatures that Sinbad (Kerwin Mathews) and his crew meet are animated clay figures. Of course, the effects don’t look great now, but considering this move came out 55 years ago, they’re still pretty impressive. There’s one scene in particular of a sword fight between Sinbad and a skeleton that doesn’t look real per se, but the coordination between Mathews and the animation is pretty cool. The animation in this movie is pretty remarkable. Yes, the story is below subpar but in the end this movie is far better than most action movies with CGI today. Elizabeth and I watched this because we have started to consciously watch movies on the National Film Registry and this is one that was easily accessible. I really think that I’ve seen this before, as a kid, but I’m glad Elizabeth and I decided to watch it. Like I said, nothing special in the plot; it’s really all about the animation.